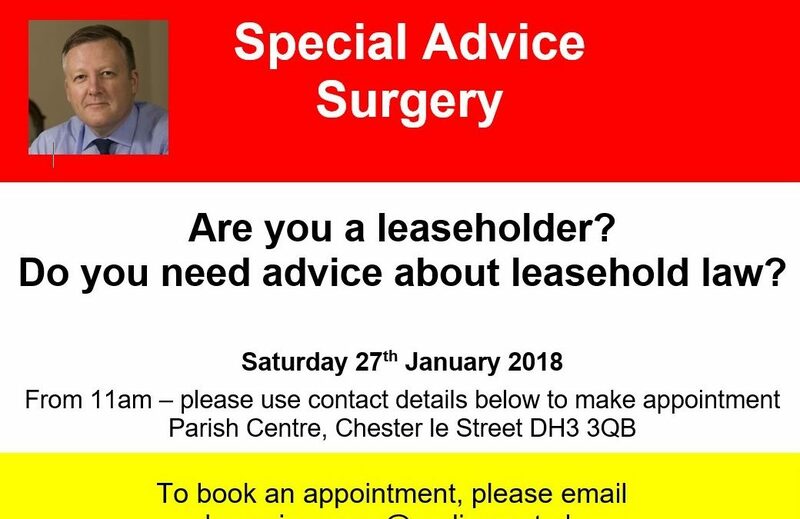 Kevan Jones MP is holding a Special Advice Surgery on Saturday 27 January 2018 in partnership with LEASE, the Leasehold Advisory Service who will provide up to 15 minutes of free legal advice. The Special Advice Surgery will be held at the Parish Centre, Church Chare, Chester-le-Street, DH3 3QB from 11am. Please call 0191 371 8834 or email [email protected] to arrange an appointment. Due to the nature of this event, attendance is by appointment only. This event is in addition to Kevan’s monthly advice surgeries which are held on the first Saturday of every month.